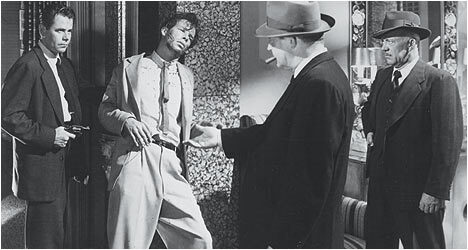 Film noir is a tricky genre to get a handle on. Film critics and historians argue endlessly about how to define it but they certainly know one when they see it. Classic film noir typically is set in an urban environment – rainy nights, shadowy alleyways and smoky nightclubs populated by down-on-their-luck private investigators, hard-boiled cops and ruthless hitmen. It was born out German Expressionism and American pulp novels often directed by filmmakers from Europe escaping the onset of World War II. Columbia Pictures has recently released a box set with five previously unreleased gems on DVD (with the exception of The Big Heat). The Sniper (1952) features Edward Miller (Franz), a lonely troubled man – a ticking time bomb ready to explode. He served time in the psycho ward of a prison for hitting a woman. Miller tries desperately to get help but no one will give him the time of day. He has trouble relating to women and takes out his frustration by shooting and killing them with his sniper rifle. Arthur Franz does an excellent job of playing a conflicted serial killer. You can see the inner turmoil all over his face and in some ways he’s kind of a tragic figure – a cinematic prototype for Travis Bickle in Taxi Driver (1976). In The Big Heat (1953), police detective David Bannion (Ford) investigates the suicide of a fellow officer who was ill. However, an ex-lover of the deceased tells Bannion that it wasn’t suicide. She soon winds up brutally murdered and despite pressure from his superiors, Bannion continues his investigation. He soon finds himself butting heads with a powerful gangster and his vicious henchman played by a young Lee Marvin. Glenn Ford is quite good as a loving family man and dedicated cop. Bannion is willing to pursue a case with single-minded determination despite all the obstacles thrown in his path. He’s also tough and more than capable of taking care of himself in a fight. Based on a short story by Jack Finney (who wrote the book that Invasion of the Body Snatchers was based on), 5 Against the House (1955) features a quartet of Korean War veterans enjoying themselves on a gambling trip to Reno, Nevada. They goof around and have fun trying to pick up women. One of them, Al (Madison), has a girlfriend named Kay (Novak) who is a sultry nightclub singer and the film’s femme fatale. Another one of the group, Brick (Keith), becomes extremely violent when provoked – a byproduct of his experiences in the war – so you know he’s going to be trouble later on in the film. The quartet returns to college and the humdrum routine of the daily grind. The brainy one of their group devises a plan to rob one of the casinos in Reno for one million dollars. Of course, this being a film noir, it isn’t going to be that easy and the “perfect” plan begins to unravel. Director Don Siegel wastes no time as The Lineup (1958) starts off with an exciting chase as a taxi cab driver tries to drive away with a stolen suitcase, runs over a cop and is shot and killed. Inside the case is a statuette containing $100,000 worth of heroin. The cops return the case to its owner in the hopes that he’ll lead them to a possible narcotics ring. Siegel does a good job showing us the process of a police investigation: inspecting the crime scene, questioning witnesses, the forensics lab and organizing line-ups of potential suspects. Eli Wallach plays Dancer, a sociopathic hitman who figures into the drug deal. He’s a consummate professional judging from the way he questions the driver of his car for the job at hand. The Lineup’s most memorable sequence is an exciting car chase that takes place on the then-unfinished Embarcadero Freeway in San Francisco and anticipates other intense chases in The French Connection (1974) and To Live and Die in L.A. (1985). The last film in this set is Murder by Contract (1958). Claude (Edwards) moonlights as a hitman who doesn’t make mistakes. He’s pretty sure of himself and smart. He does a few jobs, saving up the money he makes to buy a house. Claude’s latest job takes him Los Angeles where he’s contracted to kill a woman who is set to testify against the mob. It’s the first time he’s had to kill a woman and his cool confidence is visibly shaken. She’s heavily guarded by the cops and Claude has to bide his time and pick his moment. Murder by Contract takes it time to show Claude’s methodical nature and how it is put to the test with this latest assignment. The Sniper features an audio commentary by author Eddie Muller. He starts off talking about the origins of the film – a husband and wife writing team. He mentions that it was a very controversial film at the time because of its subject matter. Muller provides all kinds of fascinating production details, like how much of the film was shot on location in San Francisco. He explains that The Sniper is a landmark film because it was one of the first to prominently feature a serial killer. “Martin Scorsese Presents The Sniper” features the legendary filmmaker talking about the documentary feel of the film thanks to the use of authentic locations. The Big Heat starts off with “Michael Mann on The Big Heat.” He speaks admiringly about the prominent female characters in the film. The director talks about the ethnic aspect of the film as well as the uncompromising nature of Glenn Ford’s character. “Martin Scorsese on The Big Heat” features the director talking about how Ford’s character becomes what he’s fighting against. Scorsese draws particular attention to the flat look of the film and how director Fritz Lang directs us to the behaviour of the characters. Also included is the original theatrical trailer. The only extra for 5 Against the House is the original theatrical trailer. The Lineup includes an audio commentary by author Eddie Muller and James Ellroy. Muller says that this film started off as a television show cut from the same cloth as Dragnet. He plays the straight man on this track, rattling off facts, while Ellroy is his usual colourful and profane self offering his bizarro opinions on this film. He sings the praises of Don Siegel’s more than capable direction. Fans of Ellroy will love this track as he gets to cut loose have some fun commenting on The Lineup. “The Influence of Noir with Christopher Nolan” sees this respected director citing noir as an influence on his own work, most notably the psychological states of the characters, the atmosphere and the style in relation to the substance and how they all interact with one another. Murder by Contract features “Martin Scorsese on Murder by Contract.” He reminisces about when he first saw the film as a teenager and how it would later influence aspects of Taxi Driver. The director speaks admiringly of the “economy of means” – how Irving Lerner depicted the passing of time. Scorsese gives us a brief background to Lerner and talks about how he got to know and even work with him. Finally, there is the original theatrical trailer.